Try your hand at the newest addicting puzzle craze to come out of Japan—Neves Plus (aka Hamekomi Lucky Puzzle in Japan)! 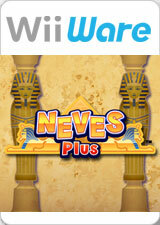 Enhanced for WiiWare, Neves Plus not only retains all the simple, mind-bending tangram-based game play from the original Nintendo DS version but includes all new multiplayer modes wrapped up in an Egyptian theme. This time, you and up to three others can work together to move, rotate, and flip the seven Lucky stones into each of the 500+ silhouette puzzles. Or, you can challenge one another in any of the new multiplayer modes such as Versus, Speed, Lucky Number, and Party Mode! Whether you play every mode by yourself or with friends, Neves Plus is set to charm you with its deceptively harder-than-they-look silhouette puzzles. The graph below charts the compatibility with Neves Plus since Dolphin's 2.0 release, listing revisions only where a compatibility change occurred. This page was last edited on 1 August 2018, at 10:19.